Click on vignette to diplay the calendar half-year 2020. Half-year calendar style calendar of posts with photo in the centre. 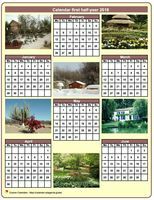 This half-year style calendar old calendar of posts is particularly adapted to the realisation of a family decorative calendar or of holiday. To replace the photo with one of your personal photos, of the site or of the web, use the tab 'Photo '. To change the colors of borders and of titles, use tabs 'Calendar ' and 'Month '. See also: All calendars photos 2020. 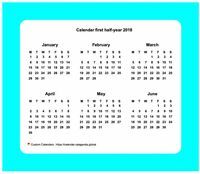 With this calendar 2020 half-year from December till June and from July till January, you get a fourteen-month calendar for double-sided printing. Use the 'Templates' tab to change the period, for example by 16 months on both sides. Use the tab 'Caption ' to change title. This calendar 2020 half-year from December till June and from July till January shows a different photo every month. Use the tab 'Templates' to change the period, for example by 16 months in both sides. Use the 'Calendar' tab to change the background image, and the 'Month' tab to change one or several small photos. Calendar 2020 half-year in column with a different photo every month. This calendar uses function 'Style sheet ' available behind the tab 'Calendar' (11). To replace photos favourably with family photographs, to click on the tab 'Month ', to choose the month then on click on 'Background '. Half-year calendar for the lovers of the cats, with a different photo for every month. To replace one of the photos, for example by that of your favourite cat, use the tab 'Month '. To see also: all calendars with cats. 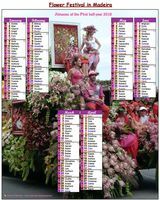 Half-year calendar 'flower festival in Madeira'. This calendar uses function available 'style sheet ' behind the tab 'Calendar ', to bring forward the third and fourth months. To replace the photo, in the tab 'Calendar ', click on the background of the calendar. Regulate the Image size to 'Height of the box' and regulate position at best across. The week number is present into Monday (8). Half-year calendar style calendar of posts. This calendar uses function available 'style sheet ' behind the tab 'Calendar '. To replace the photo, in the tab 'Calendar ', to the right of 'Titre ', click on 'Color '. Regulate the Image size to 'Width of the box' and regulate location at best. To change the height of the photo, in the tab 'Calendar ', adjust the height of title. The week number is present into Mondays (8). 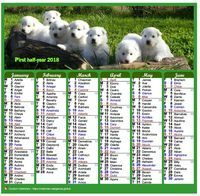 Half-year calendar for the lovers of the dogs, with a different photo for every month. To replace one of the photos, for example with that of your favourite dog, use the tab 'Month '. To see also: all calendars with dogs. - The odd columns are brought forward downwards for photos (margin-top). - Weeks are separated by a border under Sunday. To change photos, to use the tab 'Month '. To change the motive of title, to use the tab 'Calendar '. Half-year calendar with a feminine photo every month. To replace one of the photos, for example by a photo of the web or one of your photos on the hard disk of your computer or your portable, use the tab 'Month'. To see also: calendars 'Tubes women'. Half-year calendar of 6 columns in format landscape. - The background color of the name of day is yellow, and that of the number of day am cyan. - The text of Saturday is blue, and that of Sunday is brown. Half-year calendar in column with photo in the centre. To change the photo, use the tab 'Photo '. To change the background of title, use the tab 'Calendar '. Decorative half-year calendar in column, with photo frame, portrait format. A frame photo is put under the calendar (5), and it is possible to add a legend (6). Customise the layout of the calendar 2020 (dimensions, colors, alignment, police), via tabs 'Calendar', 'Month' and 'Boxes' (2). Calendar 2020 to print, half-year, tiny pocket format, white background. You will be able to customise the layout of the calendar 2020 (dimensions, colors, alignment, police, borders), via tabs 'Calendar', 'Month' and 'Boxes' (2). In the print preview of your navigator, use if need the pop-up list to adjust the size of the calendar to be printed. 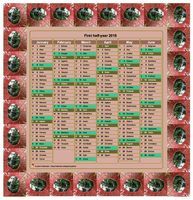 Calendar 2020 to print, half-year, tiny pocket format, green background. You will be able to customise the layout of the calendar 2020 (size of boxes, background color and boxes, alignment, police), via tabs 'Calendar', 'Month' and 'Boxes' (2). In the print preview of your navigator, use if need the pop-up list to choose the size of the calendar to be printed. 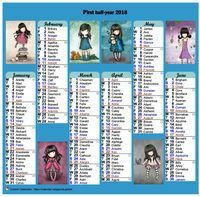 Calendar to be colored half-year, format landscape, for children. This coloring calendar 2020 will allow children to become familiar with the time: days, months, half-year and years. To change the picture to be colored, click first on the tab Photos, then 'to Choose another photo'. You will then be able to choose a personal picture (link Yours), a picture of another site or a picture of this site. Calendar to be printed half-year, format landscape, with names of saints. You will be able to customise the layout of the calendar 2020 (dimensions, colors, alignment, police), via tabs 'Calendar', 'Month' and 'Boxes' (2). Calendar to be printed half-year, format portrait, with names of saints. You will be able to customise the layout of the calendar 2020 (dimensions, margins, colors, alignment, police), via tabs 'Calendar', 'Month' and 'Boxes' (2). To adjust size or color of the border, change the available 'Style sheet ' (11) behind the tab 'Calendar '. The choice of a background color in tabs 'Calendar', 'Month' and 'Boxe' will bring the supplementary design wished by every internaut. Calendar 2020 half-year with a different photo every month. This calendar uses function 'Style sheet' behind the tab 'Calendar' (11). To replace photos favourably with family photographs, click on the tab 'Month ', choose the month then on click on 'Background'. Every internaut will be able to customise the colors of the border and of the background with tabs 'Calendar ', and 'Boxes '. To change the background color of the 2020 half-year calendar, click on the 'Calendar' tab. To display or not display the names of saints in the 2020 half-year calendar, click on the 'Data' tab. You can even display two, three, or four saints a day. Each sample 2020 half-year calendar proposed above is built from a template. All calendar templates are customizable.